From your heart to hers, show her your deepest, richest feelings with this 10 karat yellow gold and gemstone pendant. The heart shaped garnet at top is lit up by the shimmer of prong-set round diamonds. Delicate and perfect. (pendant includes 18" rope chain in 10 karat yellow gold). Garnet Size: 6mm, Heart Shaped. 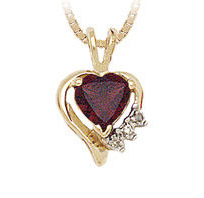 We guarantee our 10K Gold Heart Shape Garnet and Diamond Pendant to be high quality, authentic jewelry, as described above.